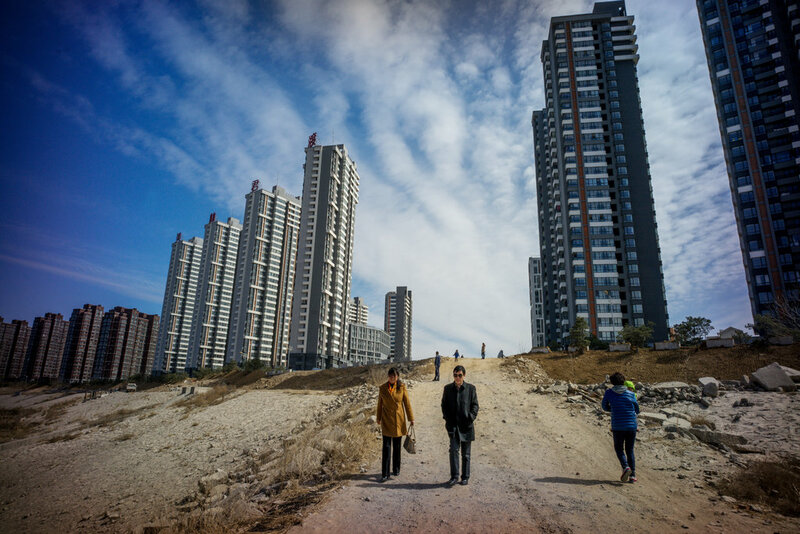 YANJIAO, China — Every morning at 5:30, Liu Desheng joins a dozen retirees waiting for the express bus to central Beijing from this small city in Hebei Province. They stand at the front of the line but never board, instead waiting as bus after bus pulls up, each picking up 50 people from the ever-lengthening line behind the retirees. Around 6:30, their adult children arrive. The line, now snaking down the street, has become an hourlong wait. People cut in, and a shoving match breaks out. But the retirees have saved their children this ordeal. When the next bus pulls up, the young adults take their parents’ places at the head of the line and board first, settling into coveted seats for a 25-mile ride that can take up to three hours. The planned megalopolis, a metropolitan area that would beabout six times the size of New York’s, is meant to revamp northern China’s economy and become a laboratory for modern urban growth. This month, the Beijing city government announced its part of the plan, vowing to move much of its bureaucracy, as well as factories and hospitals, to the hinterlands in an effort to offset the city’s strict residency limits, easing congestion, and to spread good-paying jobs into less-developed areas. Jing-Jin-Ji, as the region is called (“Jing” for Beijing, “Jin” for Tianjin and “Ji,” the traditional name for Hebei Province), is meant to help the area catch up to China’s more prosperous economic belts: the Yangtze River Delta around Shanghai and Nanjing in central China, and the Pearl River Delta around Guangzhou and Shenzhen in southern China. But the new supercity is intended to be different in scope and conception. It would be spread over 82,000 square miles, about the size of Kansas, and hold a population larger than a third of the United States. And unlike metro areas that have grown up organically, Jing-Jin-Ji would be a very deliberate creation. Its centerpiece: a huge expansion ofhigh-speed rail to bring the major cities within an hour’s commute of each other. The Jing-Jin-Ji region will link 130 million people across Beijing, Tianjin and Hebei. But some of the new roads and rails are years from completion. For many people, the creation of the supercity so far has meant ever-longer commutes on gridlocked highways to the capital. Encouraged by Hebei Province’s relatively open residency policies and inexpensive housing, people are flocking to suburbs like this one. Yanjiao has grown tenfold, to as many as 700,000 inhabitants, in a decade. But it remains a bedroom community for Beijing — a swath of apartment towers and restaurants with few services. Many believe that the transportation woes will sort themselves out, given enough time and money. A subway and better light rail are planned to open in three to five years, and a new bridge over the Chaobai River to Beijing is under construction. On a bright summer morning, it is easy to see Yanjiao’s better side. Even though the cookie-cutter, 25-story housing blocks stretch dully into the horizon, shopping is plentiful, some streets are tree-lined and the air is much cleaner than in Beijing. But the city has no bus terminals, no cinemas and only two very small parks. Even by the cheek-by-jowl standards of Chinese public spaces, Yanjiao’s main park is hopelessly crowded. On a recent Sunday afternoon, in-line skaters bumped into each other at a strolling speed, kite lines crossed in the air and older men politely jostled each other as they practiced calligraphy with water brushes on the sidewalk. The lack of services reflects deeper challenges. With no property taxes, Chinese cities rely on public land sales for tax revenues. Municipalities are not allowed to keep other locally raised taxes, for fear that local leaders will misuse the proceeds. So a bedroom community like Yanjiao has no way to pay for new schools, roads or enough bus service so that retirees do not have to stand in line on behalf of their children. Changing this would require restructuring how taxes are collected and distributed, an overhaul that is not on the table. Even though the supercity will consolidate affluent Beijing with tax-starved towns like Yanjiao, they will not share revenue. But several factors are making Jing-Jin-Ji a reality. The most immediate is President Xi Jinping, who laid out an ambitious plan for economic reform in 2013 and has endorsed the region’s integration. Beijing is shifting much of its city administration to the Tongzhou suburb, ending the longstanding practice of putting government offices in the old imperial district. The plan has started to drive up property prices in the suburbs, according to local news reports. Improving the infrastructure, especially high-speed rail, will be critical. According to Zhang Gui, a professor at the Hebei University of Technology, Chinese planners used to follow a rule of thumb they learned from the West: All parts of an urban area should be within 60 miles of each other, or the average amount of highway that can be covered in an hour of driving. Beyond that, people cannot effectively commute. High-speed rail, Professor Zhang said, has changed that equation. Chinese trains now easily hit 150 to 185 miles an hour, allowing the urban area to expand. A new line between Beijing and Tianjin cut travel times from three hours to 37 minutes. That train has become so crowded that a second track is being laid. recreational center for the new urban area, as well as a candidate to host the 2022 Winter Olympic Games. Wang Jun, a historian of Beijing’s development, said creating the new supercity would require a complete overhaul of how governments operated, including instituting property taxes and allowing local governments to keep them. Only then can these towns become more than feeders to the capital. This article is Adam Wu contributed research and appeared first on New York Times.